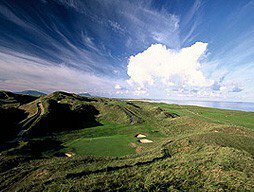 Carne Golf Links lies in magnificent unspoiled sand dunes overlooking Blacksod Bay and the wild Atlantic Ocean near Belmullet Co. Mayo in the west of Ireland. Carne was the last links course to be designed by the late Eddie Hackett and it is now believed by many who have played it to his greatest challenge. Carne Golf Links is not yet in our pool of Golf Courses for orders.